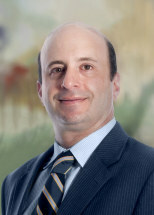 Kevin L. Lenson joined Elk & Elk Co., Ltd. in January 2010 and focuses his practice on auto accidents, workplace intentional torts and premises liability. Kevin was honored to be listed as an Ohio Super Lawyer in 2015, 2016, 2017 and 2018. He passed the bar in 1996 and has worked for two plaintiffs’ law firms in Northeast Ohio since. He earned his undergraduate degree in political science from the University of Wisconsin in Madison in 1992 and went on to earn his law degree from the University of Toledo in 1996. Lenson’s professional memberships include the Ohio Academy of Trial Lawyers and the Ohio State Bar Association. He’s married, has a daughter and two sons and resides in Solon. He said he takes “great care” with each and every client and it’s his satisfaction in helping them see their way to a fair resolution that makes him most satisfied with his work. Lenson said any effective client-lawyer relationship is built on a solid foundation of good communication. He said aside from making sure his clients know the status of their cases, he likes to check up on their progress, health-wise, make sure their families are weathering the legal concerns in the wake of an unfortunate incident, and reassure them everything is going to be OK. He said joining Elk & Elk Co., Ltd. and being able to use the firm’s vast resources will only help him get that feeling more and more. Worksite accident where our client sustained a closed head injury and missed a significant amount of work following the accident. $555,000 – Motor Vehicle Accident results in fractured leg and vertebrae. Our client was being transported in an ambulette and was not properly fastened. The client sustained a fractured leg and vertebrae. Motor vehicle accident where are client suffered a fractured dominant left wrist requiring 3 operations and missed over a year from work.